- The stilt structure. Much of the first floor is supported by external stilts, reflecting Greek peristyles, creating a covered walkway which, in this particular case, is used for vehicle traffic! - The roof terrace. 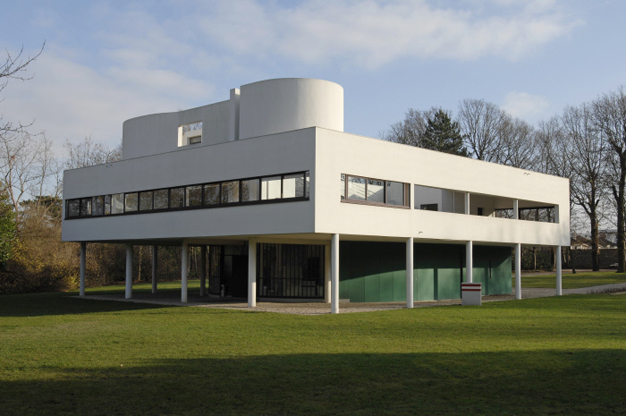 The Villa Savoye has two flat roofs on different levels, each a separate living space: a hanging garden on the first floor and a solarium on the second floor. - The open-plan layout: Since the floors are “only” supported by a network of reinforced concrete posts/stilts, the walls have no load-bearing function and therefore act exclusively as both interior and exterior partitions. The layout is therefore described as “open-plan”. As a result, Le Corbusier was able to design an 86 m² living room that opened out onto the external space, with three full-length windows on three sides and a single window panel measuring an extraordinary 9 x 3 metres! - The “open” façade: Due to the structure mentioned above, the façades are known as “open” since they no longer support any weight. Le Corbusier created a series of new windows on the façade, and was able to use any shape of his choosing, since he was not bound by structural constraints. As a result, in order to bring as much light as possible to the ground floor and to create diverse external spaces, he designed a curved and glazed façade, as can be seen on this level. - The ribbon windows: These windows consist of two horizontal, glazed panels, one of which slides open along the full length of the other. Le Corbusier placed these in the middle of the façade, bringing as much light as possible into every room in the house. It is this profusion of panoramic light with no blind spots that inspired Mr and Mrs Savoye to give their country residence its nickname, “Les Heures Claires” (bright times).